Rising food prices made the headlines for the past years and have mainly been led back to natural phenomena - which fit perfectly into the omnipresent discussion about climate change. A factor that has remained widely disregarded is the effect of financial speculations on food prices. Arguments that extensive speculations on agricultural commodities drive the prices of the very commodities are pulling in votes. Maren from Kenya is one out of many who suffer from rising food prices which have continued to soar in the past years. Between 2006 and 2008 the Food and Agricultural Organization (FAO) registered a price increase of 71% for the most essential food staffs. People in poor countries spend an average of 80 percent of their income on food which leaves them extremely vulnerable to price increases. A price increase of 71% leads to approximately 50% in additional expenses in developing households. Consequently, the number of hungry people passed one billion for the first time in 2009. Hunger protests in 61 countries left no doubt about the outrage of the global population. The 101 of economics…or gambling?! But what are the reasons for this explosion of food prices which seem to have taken many by surprise? The reasons for the commodities boom go far beyond mere natural occurrences that have put constraints on the supply. On the contrary, an ever increasing demand seems to push prices into dizzy heights. First of all, the world population is growing by 80 million people each year. The national economies of the emerging markets attain annual growth rates of eight to ten percent and with them the demand for commodities. Simultaneously, more countries are cultivating corn, soybeans or rapeseed to produce biofuel. Its production attributes to half of the increased demand in agricultural products. “Another aspect is the oil price which also has an impact since tractors need fuel and fertilizers contain oil. Rising oil prices also create an incentive to produce more biofuel”, says Leon Leschus, expert for commodity markets at the World Economic Institute in Hamburg (HWWI). In general, the demand increases much more rapidly than the supply which – according to the basic law of demand and supply - causes the prices of raw materials to increase. Rising food prices cannot be solely led back to an increase in demand but to a capital influx on the commodity exchanges. German financial institutions, such as Deutsche Bank or Allianz, have invested 11.4 billion Euros in agricultural commodities in 2011. In 2008 the number had been significantly smaller at a level of about 2.7 billion Euros. 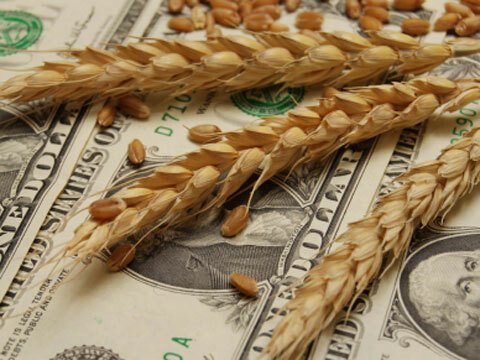 How could investments in agricultural commodities become that attractive? And what does this have to do with their prices rising? …a grain grower in Germany wanted to sell his future wheat harvest to a miller in France. Since he wanted to protect himself from price fluctuations he engaged into a contract with the miller. This contract assured that the grain grower would deliver 50 tons of wheat to the miller at harvest time and get 200 Euros per ton in return. This contract was negotiated by an intermediary bank which charged both, the grain grower and the miller, a fee for matching their bids. In return, the bank compensated either party for potential losses when the prices for wheat would change. The bank hedged the risk for the grain grower in case the prices fell and he would earn less than 200 Euros per ton at the time of the harvest. At the same time, the bank would pocket some of the profit in case the prices would rise and the grain grower could actually earn more than 200 Euros per ton. The same deal was offered to the miller. Historically, intermediaries, or speculators, are an integral part of the commodities exchange. By acting as brokers they assure that every grain grower finds a miller to protect each other from price fluctuations. “It is a necessary precondition for the exchange that every market participant finds a trading partner as often and as fast as possible”, says Prof. Dr. Stefan Prigge, holding a chair at Hamburg School of Business Administration (HSBA). This abundance of sellers and buyers is known as market liquidity. The speculators themselves are not interested in the physical exchange of the commodity but in the financial profit they can earn from the contracts which came to be known as futures. Back then, commodity exchanges have been dominated by grain growers, millers and the like who tried to secure their business from changing prices. In December 1998, producers and real traders made up 64.6% percent of all participants whereas speculators contributed to only 35.4%. Who has taken a bite of my bread? At first, the grain grower and the miller were happy that they could secure their future business. The intermediary bank, however, started to buy more and more future contracts from grain growers all over Europe. Instead of selling the same contracts to more and more millers, the bank put all the futures into a big basket. This was a very smart move from the intermediary bank to do because it could make a lot of profit in case the prices for wheat increased. The move was so smart that other intermediary banks started doing the same. When one bank started to buy a lot of contracts, the others followed to also get a bite of the bread. When one bank suddenly sold a lot of contracts, the others did the same because they were afraid that prices might go down. This, in turn, started to really confuse the grain grower and the miller. Sometimes everyone wanted wheat and prices would rise up and at others times no one wanted wheat and prices would drop. So each year at harvest time they just hoped to have prices on their sides. The year 2000 has marked a radical change of regulations on the commodities markets. The Commodity Futures Modernization Act in the US enabled more and more speculators to trade with an increasing volume of future contracts. In addition, commodities became popular as a new asset class to reduce risk coming from stocks or the struggling real estate sector. Thus, the market composition has changed completely. In December 2011 the percentage of producers and processors on the commodities exchange decreased to 32.5% and at the same time speculators had a stake of 67.5%. This implies that futures are used less for hedging purposes but as capital investment, mainly in the form of commodity index funds. A commodity index is like a basket that contains different commodities and reflects the development of the futures prices of these commodities. Banks started to offer their clients to invest in commodities and they continuously buy new futures to feed their index funds; regardless of the actual supply and demand of the commodities involved. “Futures can theoretically be used for speculation purposes only. This means that commodities can be sold without having been bought from a farmer before”, explains Justin Pfitzenreuter, commodity trader at Agravis Raiffeisen AG. The more people invest into index funds the more this drives futures prices and attracts even more investors. For, if the future contracts increase in value, the value of their capital investment will do so as well. These mass movements amplify minor prices changes, which is referred to as a high volatility of prices for futures. By buying contracts for speculation purposes banks and other intermediaries are competing directly with the processors who buy future contracts for hedging. And they gambled happily ever after…or not? Coming back to the grain dealer who had observed the price changes on the wheat market for a little while. He started to realize that there were times when everyone wanted to buy wheat and would pay almost any price for it. This was a very good thing for the grain dealer because he could sell his wheat for a higher price during these times. The problem was that it was hard to predict when the banks liked to buy wheat and when they did not. So the grain dealer would sometime wait and store his wheat harvest for some month. He did this because he expected the wheat prices to rise and his revenue to become even bigger in the future. Speculations have an impact on the prices of commodities themselves. This is often disputed by high-ranking theorists, like Paul Krugman. The winner of the Nobel Prize in Economics argues that future prices do not affect the prices on the physical market, called the spot market. However, the authors of a study for the International Food Policy Research Institute (IFPRI) in Washington conducted a number of causality tests which indicate that the futures markets analyzed generally dominate the spot markets. Price changes in futures markets lead price changes in spot markets more often than the reverse, especially when examining returns. In line with this, the investment in index funds is also said to drive the prices on the spot market. This was confirmed by a report of the two economists John Baffes and Tassos Haniotis who came to the conclusion that index fund activity played a key role during the 2008 price spike. “The food crisis in 2008 can mainly be led back to constraints on the supply of rice”, says Leon Leschus (HWWI). “Huge amounts of rice were hoarded because people expected the prices to rise and to earn more money for selling the rice later in time.” There is no doubt, that extensive capital investment affects the prices on the commodities market. However, Leschus emphasizes that the fundamental data, such as weather conditions or natural disasters, remain the key factor in determining commodity prices. Although it cannot be negotiated that excessive financial speculations have an effect on food prices, the financial market remains widely untouched by regulations. Recent calls to limit the scope of actions for financial institutions on the commodities markets are still far from being implemented. The European Commission (EC) has worked on three draft laws to increase transparency and supervision of the financial markets. They should have been put into practice by 2011 but the revision process still lasts. A number of publications of non-profit organizations, such as Oxfam or foodwatch, have created public awareness of the topic recently. They managed to put at least some pressure on the financial industry. The heavyweight of the German financial industry, Deutsche Bank, has announced not to launch any new commodity index funds in 2012. However, there is a long way to go to find common ground, although it is hard to believe that anyone could object the ultimate goal: It is one of the Millennium Development Goals (MDG) to reduce the proportion of people who suffer from hunger by half by 2015. Affordable food prices are a key factor to reach that aim and speculations driving prices should come to a halt. Because it is one of the first virtues we all learn: Don’t play with your food! OECD/ FAO 2011: http://www.keepeek.com/Digital-Asset-Management/ oecd/agriculture-and-food/oecd-fao-agricultural-outlook-2011-2020/biofuels_agr_outlook-2011-8-en. Oxfam Germany 2012: http://www.oxfam.de/sites/www.oxfam.de/files/ 20120511_mit-essen-spielt-man-nicht.pdf. Oxfam Germany 2012: http://www.oxfam.de/sites/www.oxfam.de/files/20120511 _mit-essen-spielt-man-nicht.pdf, calculation based on data of the U.S. Commodity Futures Trading Comission (CFTC) excl. small, non-reporting companies. Baffes, Haniotis 2010: http://www-wds.worldbank.org/servlet/WDSContent Server/WDSP/IB/2010/07/21/000158349_20100721110120/Rendered/PDF/WPS5371.pdf.